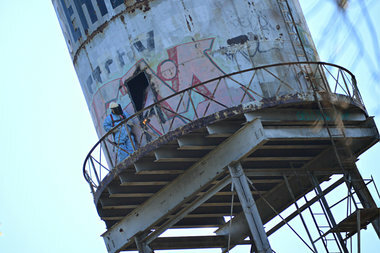 A worker can be seen along the Rosehill Cemetery water tower cat walk Wednesday with a blow torch. WEST RIDGE — The Rosehill Cemetery water tower, now sitting in the future site of the West Ridge Nature Preserve, will likely see its last days in the neighborhood this week, according to demolition permits issued Tuesday. On Wednesday, crews could be seen working along the tower's catwalk, using a blowtorch to get through the tank's exterior. When the park district bought the 20-acre park from the cemetery for $7.7 million in August 2011, the cemetery's owner, Service Corporation International, retained the rights to the water tower and its pump house — as well as anything that may eventually replace it, including a place to house wireless cell tower machinery and other utilities equipment. SCI also owns the pond, according to the agreement. What will become of the tower once it is taken down remains to be seen. Ald. Patrick O'Connor's office said the tower was under the jurisdiction of the Chicago Park District and did not have comment, while Jessica Maxey-Faulkner, a park district spokeswoman, said the tower falls under the purview of the cemetery. She said the park district did not order the demolition permits. A representative from SCI said the company "would prefer to not participate in the story." Contracts for the tower's wrecking were given to Omega Demo from Elgin, and Thomas Sucich of Manhattan, Ill.
Katy Krigbaum, a member of the nature preserve's park advisory committee, said she was told the tower was no longer needed for the grounds' watering system. "Since it is no longer needed, the West Ridge PAC is pleased that it is being removed before the opening of the Preserve," she said. Jim Kriegsmann, who said he was part of the park's advisory council until about six months ago when he left after feeling the council's suggestions weren't being taken seriously by the park district, said he felt the tower was an "eyesore" that added no aesthetic value to the area. Resident Allison Kelliher-Paz said she could see why some people would find historical significance in the water tower, especially considering the temporary removal of the Andersonville's iconic water tower nearby. However, she said, "the Rosehill water tower seems to be drawing graffiti at this point," adding that she worried the vandalism "could cause problems for other areas of the new nature preserve." Richard Kelliher-Paz said he wasn't sad to see the tower go because not only has it been the site of vandalism over the years, but it's "seemingly extremely reckless" to allow anyone to have access to a ladder to climb the tower— heightening a risk of injury, he said. News accounts tell of one death from someone who fell from the tower 75 years ago. On March 29, 1939, carpenter Johannes Nielson. 40, was working on the catwalk when he fell 80 feet to his death, according to the Tribune. A coroner's report states that Nielson "lost his footing" while on the tower. 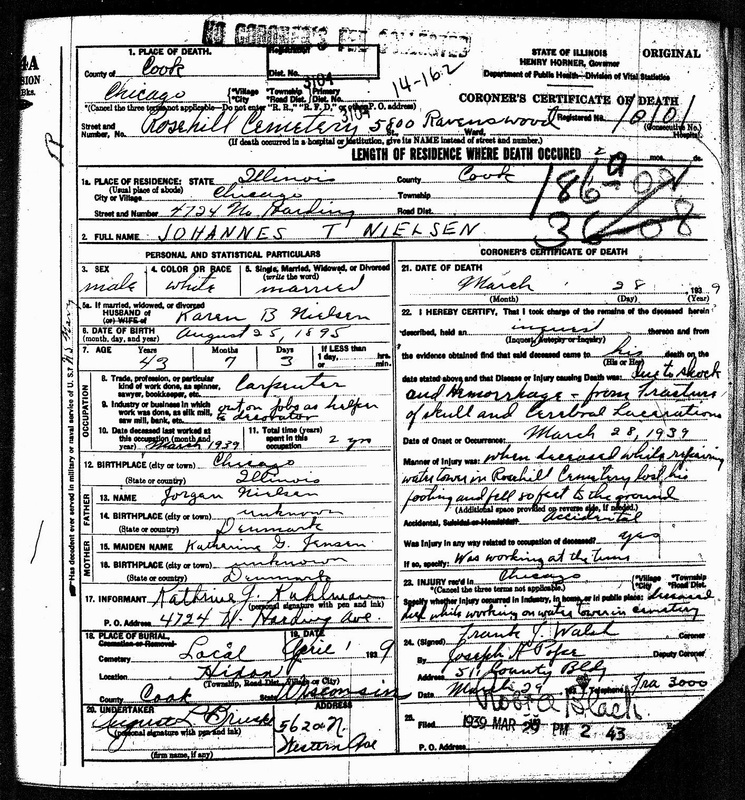 His obituary in the Owen, Wis., Enterprise newspaper said the steel ladder from which he was working "gave way," according to cemetery blog Under Every Stone. Still, Kriegsmann said, what was supposed to become a nature preserve has been transformed into more of a recreational park. "The bottom line is the [park advisory committee] has no real consequences, they turn it into a park they might as well get rid of the water tower, that makes sense," he said. "But [the park district] they're not doing what we're asking them to do, they're not telling us what they're doing ... It's a shame."